Hooray! Most of my tomatoes have sprouted! The Italian Roma has not sprouted any, but all the others have at least one sprout. Once Stupice and one Mortgage Lifter haven’t sprouted yet. But other than that I’m really happy with the success on these tomato seedlings. Last year I put the tomato seedlings under the grow light after the seedlings had sprouted and were showing leaves like these in the picture. Later I read that you should start the tomatoes under the grill light immediately when they first come out of the soil. 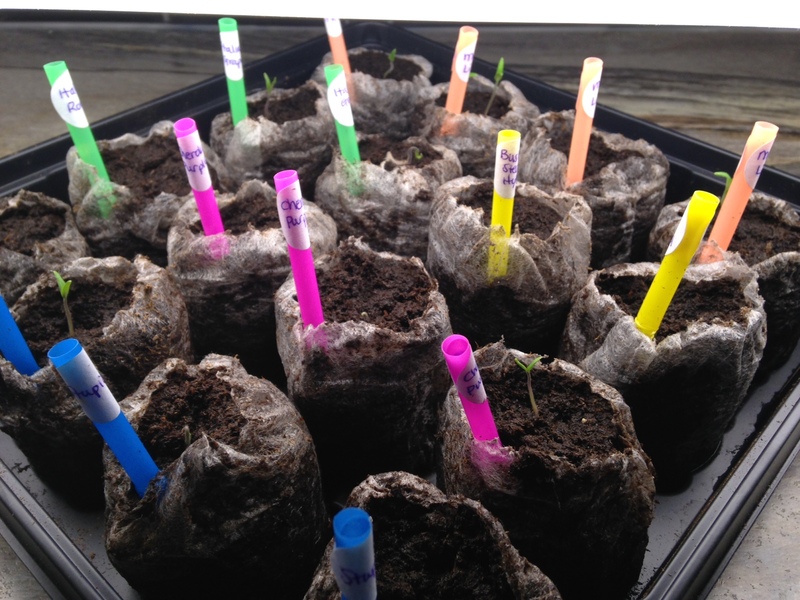 So this year I put the tomatoes under the grow light as soon as I saw the first band of little white tomato stalk coming up out of the ground. I’m hopeful that I’ll get better, less spindly seedlings using this method.